Using the intelligent tester's data list allows switch, sensor, actuator and other item values to be read without removing any parts. Reading the data list early in troubleshooting is one way to save time. Connect the intelligent tester (with can vim) to the dlc3. 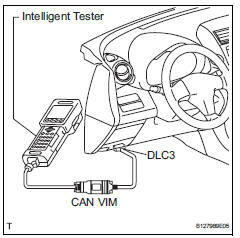 Turn the ignition switch on and turn the intelligent tester on. Read the data list by following the prompts on the tester. Performing the intelligent tester's active test allows relay, vsv, actuator and other items to be operated without removing any parts. Performing the active test early in troubleshooting is one way to save time. The data list can be displayed in the active test. Perform the active test by following the prompts on the tester.